David Ortiz slammed his first home run of the 2014 season, Dustin Pedroia had four hits, and Mike Napoli drove in four runs with a 2-run homer and a 2-RBI single as the Red Sox pounded the Orioles 6-2 at Camden Yards to even their record at 1-1 in the new season. 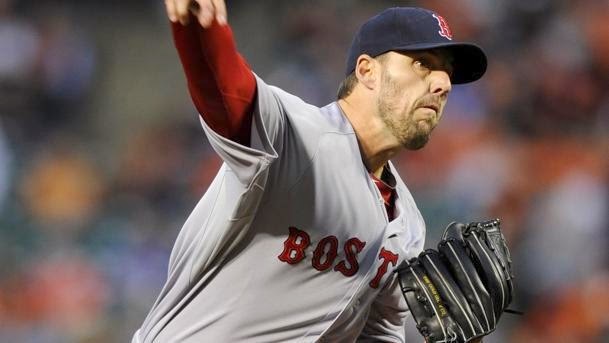 John Lackey (pictured) pitched well, tossing six strong innings to earn the win. He was charged with two runs on three hits and a walk while striking out six. One of those hits was a 2-run shot by Nelson Cruz which tied the game in the bottom of the fourth inning. Lackey threw 68 of his 90 pitches for strikes. Ortiz put the Red Sox up 2-0 in the top of the 3rd inning with a home run to right field off Baltimore starter Ubaldo Jimenez; it came with Pedroia on base. Lackey retired eleven Orioles in a row before a 2-out walk and Cruz's subsequent game-tying home run in the bottom of the 4th. Boston went back on top by a pair in the top of the 5th inning when Napoli unloaded off Jimenez; he added another pair of runs on a single in the top of the 7th off reliever Ryan Webb. The Red Sox used three relievers - Edward Mujica, Junichi Tazawa and Koji Uehara - in securing the team's first win of the year.